Please refer to our stock # 1934 when inquiring. 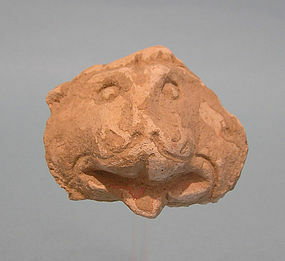 Mameluke Stucco Fragment Head of a Lion, 13th Century. 2 1/4" high. Some pigment remains around mouth. Ex: Arieh Klein, Jerusalem. The Mameluke Period (1250-1517 CE) In 1260 the Mameluke rulers of Egypt conquered Palestine and became the new masters of Jerusalem. While Mameluke Jerusalem bore prime religious importance, politically it was insignificant. The Mamelukes were soldiers who had been brought to Egypt as property of the ruler from the Central Asian steppes. Since they had been brought into the fold of Islam, they felt a deep commitment to that religion. This was reflected in intensive building in Jerusalem, which has left its mark on the Old City to this day, particularly around the Temple Mount.